Editor’s note: Ryan Clarke is a biochemistry PhD candidate with an interest in genetic engineering. He is a published scientist with a background in synthetic biology and social analytics. James Hyun is a PhD student in the life sciences with a background in molecular biology. He has published numerous scientific papers where genetically engineered microorganisms were used to produce high value therapeutic proteins. Over the years, the debate surrounding the ethics of genome engineering research and applications has cultivated a sense of fear that societies depicted in movies like Gattaca, or the book Brave New World, could come to fruition. Although these scenarios seem socially impossible to execute, they were ultimately deemed scientifically far-fetched because the complexity of such tasks requires robust genome engineering skills and tools. These discussions presented the notion that similar situations would begin to be confronted in the “distant” future, but that future is now. On April 22, 2015, the first-ever attempt to genome engineer a living human embryo was published in Protein & Cell, and this attempt was made possible by the newly embraced CRISPR-cas9 system. The CRISPR-cas9 system makes gene editing in many organisms and cells — like our own egg, sperm or embryo — more efficient, accessible and simple than ever before. These groundbreaking capabilities have spawned discussions surrounding the ethics and applications of the new system, and have garnered significant attention around the world to ensure ethically correct usage. This article is a follow-up to the recent TechCrunch article by Michael Solana regarding superhumanity being achieved through genome engineering; it explains the what, how and why of the system responsible for these rapid advancements. More importantly, the outstanding medical accomplishments achieved using the system, as well as the realistic prospects of germline engineering, will be briefly discussed with the hope of alleviating confusion and fears of the status of human genome engineering. Clustered regularly interspaced short palindromic repeats (CRISPR), and CRISPR associated protein 9 (CRISPR-cas9), has revolutionized molecular biology and the field of genome engineering. Discovered as an adaptive immune system in bacteria for protection against bacteria invading viruses, CRISPR-cas9 was creatively seen by Jennifer Doudna’s group at Berkeley as a way to target and edit a genome. Consistent research and application has shown that the human genome (as well as plants, mice, bacteria, etc.) can be edited cheaply, quickly and efficiently with the CRISPR-cas9 system. In the wrong hands, the excuse of changing one’s genes for the purpose of having a healthier life can be perpetrated for many unethical changes. The premise of editing the genome is basically the same across all systems. A gene of interest is targeted to modify its function, and an enzyme cuts that gene’s DNA sequence, breaking the structure of the DNA. After the cutting occurs, a new gene can be inserted or a change to the existing sequence can be made (via a process termed homologous recombination), or a stretch of the genomic DNA can be deleted. CRISPR-cas9 is similar to other tools used for genome engineering in that it permanently modifies an organism’s genome, so that each successive generation of offspring will carry the change. The guide RNA is specific to a sequence in the genome. This specificity directs the cas9 protein to this target sequence, where cas9’s intrinsic nuclease activity cuts/modifies the DNA directly. All that changes from one gene edit attempt to the next is the guide RNA sequence. All one needs is the cas9 protein, which is available at addgene (on plasmids) for approximately $65, and a specific guide RNA to target the gene(s) of interest, which can be ordered from IDT for roughly $10 per unit. CRISPR-cas9’s major triumph over the previous technologies is that multiple genes can be edited cheaply and efficiently in one attempt. CRISPR-cas9’s recent predecessors, Zinc Finger Nucleases (ZFNs) and TALENs, required complex proteins to be engineered to recognize and bind the gene of interest in order to edit — ultimately introducing extremely high costs to successfully use the systems (see table below). And before all modern genome engineering systems, targeting vectors were the most accessible method and was discouragingly inefficient and limiting. In summary, cas9’s ability to efficiently modify and delete multiple genes at once — with high specificity — has revolutionized the field. It has empowered scientists around the world with limited resources to conduct groundbreaking research. It has allowed molecular biologists to successfully modify human cell lines and complex model organisms, like monkeys. We can now take genome engineering from the lab bench to the clinic in a dream-like fashion, making the medical application of gene therapy and engineering possible with astonishing speed. For medical research and application animal models and human cell lines are generated to emulate human diseases that are genetic in nature, and the cas9 system has been used in many impressive circumstances to date to generate these models and to begin curing diseases. HIV cure. The cells that HIV infects (T Cells) have been modified to not express the receptor (CCR5) that HIV binds to in order to infiltrate and infect our cells. These modified cells can be placed back into the bloodstream where they are resistant to HIV infection. Cystic Fibrosis. The gene responsible (a cellular ion pump, CFTR) for cystic fibrosis has been modified and fixed in human stem cells. Autism. Genes suspected of causing autism (SHANK3) are being modified at the embryonic level in monkeys to emulate and study human autism. Muscular Dystrophy. The gene typically mutated in muscular dystrophy, dystrophin, was corrected in the mouse germline to produce mouse offspring cured of the disease. Engineered T Cells (CAR T Cells). Our immune system’s T cells are being modified to recognize and attack specific cancer types. Drug Discovery and Studies. 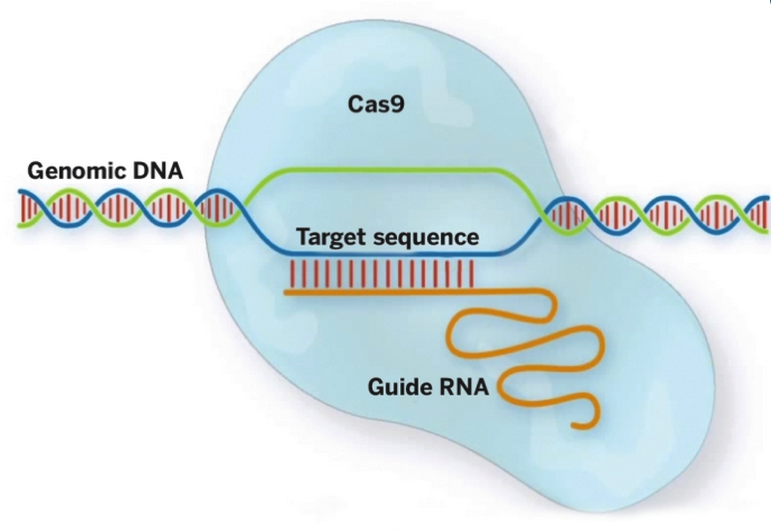 Cas9 has been used to create “genome wide knock-out screens” (screens that knock out every single gene in the genome, one at a time per cell) to search for genes that provide resistance to existing drugs, like chemotherapies, or to discover genes that contribute to certain diseases. From here, new drugs can be created or old drugs modified based on the data provided by the screen. Ph.D.s like George Church of Harvard, Feng Zhang of MIT and of course its discoverer Jennifer Doudna of Berkeley, as well as many others are pioneering the forefront of the technology in academia. In industry, there have been many biotech startups that have been founded in the last two years with the intention to use cas9 technology as a platform for creating genetic therapies and drugs for many diseases. Although the creation of “designer babies” may be possible in the near future, one has to wonder whether the scientific community would prioritize such applications over medical applications. To name a few with exciting pipelines: Editas Medicine (Zhang, Church, and Doudna), CRISPR Therapeutics, Intellia Therapeutics and Caribou Biosciences. These companies have received support from VCs, including Flagship Ventures and Atlas Ventures. Even big pharma, which is notorious for slow adoption of the newest scientific technologies, has begun to dabble with the cas9 system by partnering with some of the startups, or by collaborating and creating cas9-specific R&D wings. Understandably, the rapid usage, optimization, and further development of cas9 technology has spawned a great deal of ethical debate. With our newfound ease to theoretically modify any gene in the human genome at the germline level, scientists around the world have expressed concerns. Some have stated that human germline engineering can result in unwanted consequences and should simply not exist. Measures have even been taken in the EU to ban human germline engineering. In the wrong hands, the excuse of changing one’s genes for the purpose of having a healthier life can be perpetrated for many unethical changes. What genes are categorized as “healthy” could potentially spur black market clinics that use this technology to dictate specific traits. Social preferences may skew the genetic balance of the human species. When a biological technology is not fully understood by scientists and the public, or comprehensively discussed before major application, a dangerous game is played. Although the creation of “designer babies” may be possible in the near future, one has to wonder whether the scientific community would prioritize such applications over medical applications. The resources and manpower to successfully complete a designer baby engineering project would require much more than a skilled genetic engineer and some lab space. To support this thought, this week’s aforementioned and recent publication reported the successes and failures when using cas9 to genome engineer a human embryo. This bold study began to lay the framework for the obstacles that need to be overcome for such endeavors to become household in the lab, and they ultimately proved we have a long way to go for trustworthy embryo engineering. The study revealed many off-target effects (random introduction of mutations) and low efficiency levels for introduction of the corrective gene they were using. Therefore, actively avoiding fears and rumors like designer babies should ensure continuous progress of such an important technology. To help circumvent this, there is a growing consensus that science cannot be done with the public being kept in the dark — that there is a need to bridge the disconnect between the general public and the research conducted. Such transparency and active discussion will be imperative to the successes of the applications of cas9, because when a biological technology is not fully understood by scientists and the public, or comprehensively discussed before major application, a dangerous game is played. Global involvement will help us avoid another genetically modified foods (GMOs) situation, which stemmed from research and industry activity behind closed doors, ultimately leading to a global nebulous understanding of GMOs in general. Fortunately, a recent conference to discuss cas9’s applications in germline gene modification was held in Napa Valley led by Jennifer Doudna. “Given the speed with which the genome engineering field is evolving, the Napa meeting concluded that there is an urgent need for open discussion of the merits and risks of human genome modification by a broad cohort of scientists, clinicians, social scientists, the general public, and relevant public entities and interest groups,” stated the authors of the article summarizing the conference. Avoid human germline genome engineering for clinical application. Create forums in which experts from the scientific and bioethics communities can provide information and education about this new era of human biology. Encourage and support transparent research to evaluate the efficacy and specificity of CRISPR-Cas9 genome engineering technology in human and nonhuman model systems relevant to its potential applications for germline gene therapy. Convene a globally represented group of developers and users of genome engineering technology, and experts in genetics, law and bioethics, as well as members of the scientific community, the public and government agencies to further consider these issues and place appropriate policies. The fact that a powerful and successful discussion on applications of cas9 has been held is a major step forward for genome engineering and its applications. To make breakthroughs, there is a certain amount of risk involved, but as long as both scientists and public understand the risks and share a common purpose, we can continue to improve and use this technology for the betterment of the human race and to save lives.